Nanjing, known in ancient times as Jinfng, is the capital of Jiangsu Province. The city is surrounded by mountains and rivers at a strategic point in the lower reaches of the Yangtze River, and for this it is likened to a coiling dragon and a crouching tiger. Ten dynasties had established their capitals in Nanjing. Today this ancient city has emerged as a modern metropolis as well as a rising tourist city. The city's Qinhuai River, Confucius Temple and Sun Yat-sen Mausoleum are famed tourist attractions. 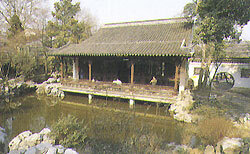 The Zhanyuan Garden and the Xiyuan Garden of Nanjing are outstanding examples of the Chinese garden culture.